Today is the little prince’s birthday! 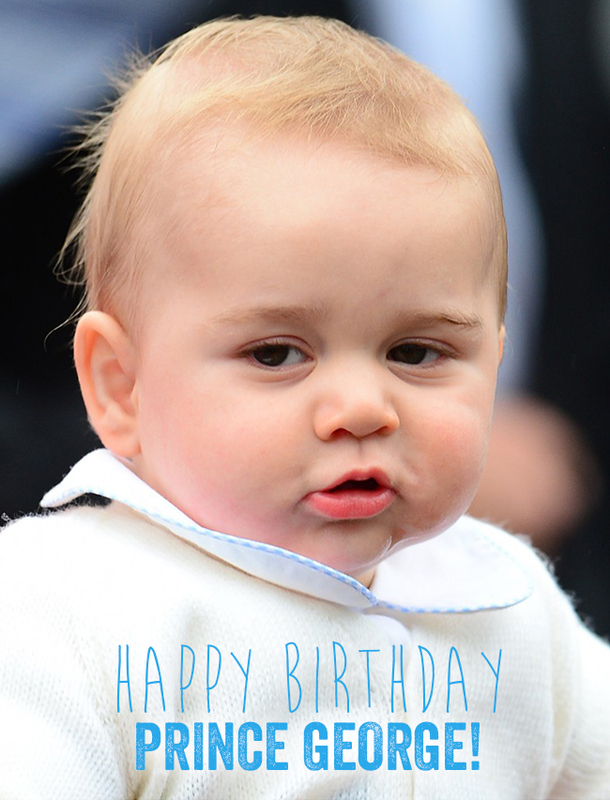 Little Prince George has turned one year old, and people around the world are checking in on how this little boy is growing up. There is no question that this little guy is going to receive some spectacular birthday gifts and probably have a birthday party fit for a king. We can’t wait to see pictures. Any guesses on what it will look like? To celebrate, we thought it would be fun to share some first birthday present ideas for the one year old in your life. Because no matter the baby, babies love to play. And bright colored toys with sounds and lights or wheels and pulls are fun for all babies. Check out some of our favorite picks for 1st birthday gifts. 1) Little Tikes Cozy Coupe – The Little Tikes Cozy Coupe ride on toy is an American classic and. Toddlers love this riding toy car’s classic design and easy maneuverability. Perfect indoors or out. The Cozy Coupe encourages active play, imagination and the development of large motor skills. 2) Fisher-Price® Classics for Baby Gift Set – We all know these classics from our own childhood and our little’s ones as well. These Fisher-Price® favorites for baby are perfect for baby play! Classics include Baby’s First Blocks (6 months and up), Rock-a-Stack® (6 months & up), Corn Popper™ (12 – 36 months), and Lil’ Snoopy (1 year & up) for colorful stacking and sorting fun for sitting babies; popping, push-along, pull-along, walk-along fun for little walkers! 3) Step2 Sand and Water Table – Littles will have hours of outdoor fun with the High Seas Adventure Sand & Water Table with Umbrella™ by Step2. With two different sides for sand and water, this activity table is perfect for multi-child play. Toddlers and preschoolers can pretend they are sailors at sea while they play on the water side and then arrive at a desert island when they use the sand side. The High Seas Adventure Sand & Water Table with Umbrella is also great for sensory play as little ones splish and splash the water and dig for buried treasure in the sand! 4) Eric Carle “Brown Bear, Brown Bear, What Do You See?” – Eric Carle has many wonderful books that are great for babies and continue to be their favorites for many years to come. “Brown Bear, Brown Bear, What Do You See?” was one of my boys favorite books as a baby….with animals and bright colors and little flaps to look under. 5) Little Tikes Wide Tracker™ Activity Walker – Little Tikes has lots of great walkers that will keep your baby entertained for hours. Colors, shapes and flip down doors will capture their attention. This particular walker has a wide wheel base provides added stability. The unique folding design lets the walker start as a baby activity gym when they are sitting and crawling. 6) Parum Pum Pum – This is one of my favorite toys that my boys played with. The B. Toys Parum Pum Pum drum offers loads of music fun. It comes with drumsticks, jingle bells, a maraca clacker, tambourine and two shaker eggs. The drum has a big handle with strap that makes it easy for your child to carry it, and it opens up to make storage for all the instruments when not in use. Hi Della! We are having some issues with our signup form. Hoping to get it working soon and we’ll let you know when it’s ready! Hey Della! It should be working now. If you type in your email address and hit “enter” it should go through!